SharePoint Alerts & Reminders is an effective web part that enhances and streamlines SharePoint Alert Management System, using a wide range of settings. 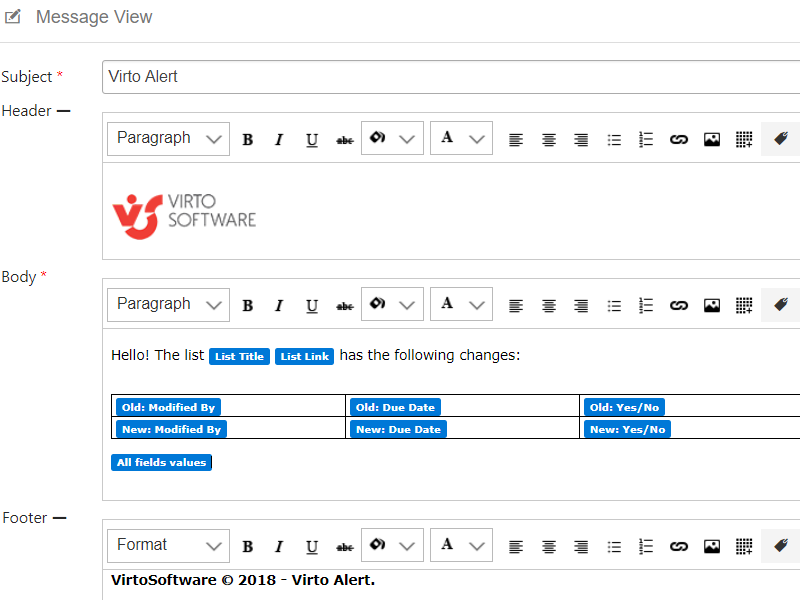 SharePoint Email & SMS Alerts and Reminders web part for Microsoft SharePoint 2019, 2016, 2013, 2010 is a part of Virto SharePoint Administration Suite that enhances and streamlines SharePoint Alert Management System. With SharePoint Alerts and Reminders Web Part, you can create your own SharePoint Alerts, Reminders, or Notifications and send them to a user, user group, contact list, or external recipients. Alerts can be sent to them as Emails alerts or SMS alerts. Try also our Office 365 Alerts and Reminders. Use SharePoint Alert and Reminder web part to build a flexible notification system on your SharePoint site. Send SharePoint alerts and reminders to users in emails, sms, or Clickatell service, fast and easy! Flexible scheduling options, reminders and notifications, precise filters to track specific item changes and many more features allow you to establish a powerful SharePoint email notification system. Define the alert sending frequency and create a summary SharePoint alert. All alert triggers will be merged in one message and inform SharePoint users on all system changes in a single alert email. This way, you avoid spamming your team. SharePoint Alert and Reminder web part won't let your team forget about any upcoming events. Use reminders to inform about important meetings, deadlines, overdue tasks, and other events. You can also create a daily reminder before or after an event and never miss out on terms to send a follow up email! 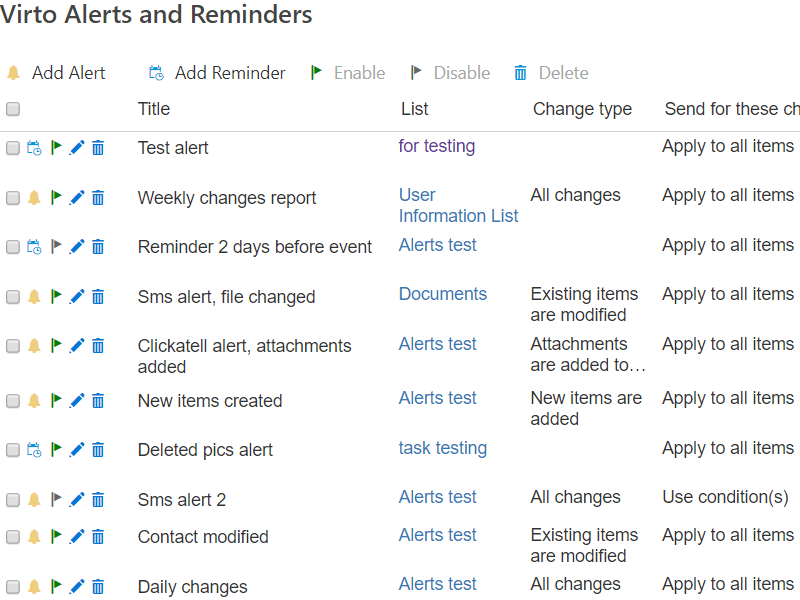 A SharePoint alert or reminder can be triggered both on list changes or specific item changes. You can select conditions or receive an alert when a chosen item was not even changed at all. Keep SharePoint users informed about changes in tasks and projects and set flexible SharePoint notifications on items and lists. You can design an email message to send SharePoint alerts, notifications, and even newsletters to users. The web part provides a wide range of tools to enhance email body with pictures, links, tables, fonts, and other features. It is also possible to customize email header and footer. The email can also include carbon copy and blind carbon copy recipients. Why Do You Need Sharepoint Alerts & Reminders Web Part? Microsoft SharePoint technologies are designed for effective organization of corporate information. They provide quick access to working information and contain powerful document management and work sharing tools. SharePoint alerts and notifications are essential features that allow users to work on their tasks and always be on schedule. Though alerts in SharePoint are flexible, they often require additional adjustment and detailed customization. SharePoint Alerts and Reminders web part provides users with this additional adjustment tool. Now, you can create your own SharePoint alert in an instant and allow it to be sent to a specific user or a group of SharePoint users. An important feature of SharePoint Alerts and Reminder Web Part is the ability to create your own SharePoint alerts, using Rich Text format. You can also define the frequency of SharePoint alerts by simply choosing one of these options: send alert immediately, hourly, daily, or weekly. SharePoint alerts can also be sent within a specified timetable (i.e., send email or sms alert only within business hours — from 8 AM to 5 PM). Also, all SharePoint alerts can be assembled into a single email, instead of being sent in several email messages. Finally, SharePoint Alerts and Reminders web part allows to send SharePoint alerts and notifications not only as e-mail alerts, but also as SMS alerts or via instant messengers, like Jabber or Miranda. Another feature of SharePoint Alerts and Reminders web part is the Custom Filtering System. This allows users to create complex terms and conditions for sending SharePoint alerts. An example would be for you to receive SharePoint notifications when your task is complete or the percentage of completion is over 90%. The option of Custom Templates makes it possible to create a body of the SharePoint Alert message within seconds. Also, SharePoint Alerts and Reminders Message Templates enable users to use different tags in the HTML-based template body. The tags are replaced with the Alert List column fields and other elements, while the message is being drafted. Send Email Alerts and Notifications using (SMTP) Create alerts in SharePoint to track any changes of your tasks and projects (and any list items) and send email alerts to SharePoint users. 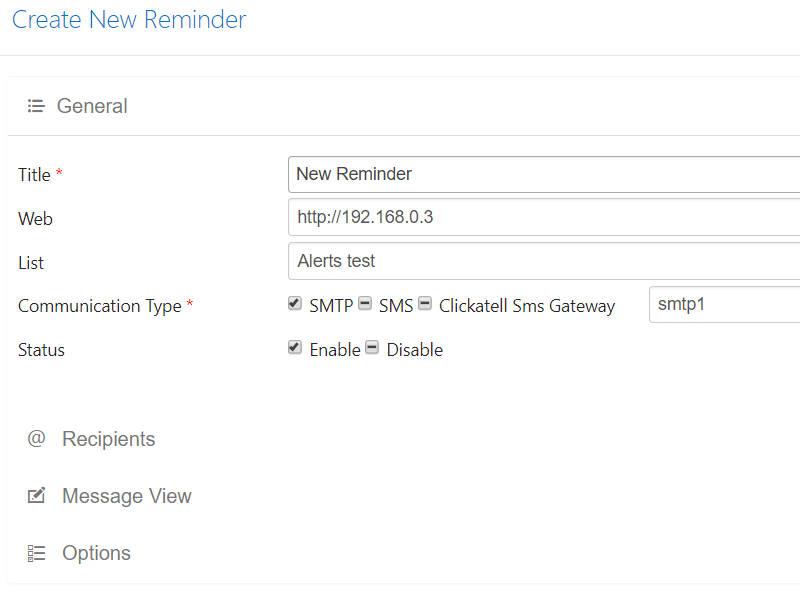 Ability to use SMPP server provider, SMS, and Clickatell for alerts SMPP and Clickatell are supported to send alerts and reminders for SharePoint users. Ability to use more than one SMTP connection Create several SMTP connections to send distinct alerts. Recipients list You can select users from list which was changed. For example, send an alert to users from “Modified by” column. Ability to add Active Directory (AD) user/group to Recipient List If alert recipients are stored in the Active Directory, you can choose this group for sending alerts. Email will be sent to all users from selected AD group. If AD Group includes sub-group, alert will be sent to all users from sub-group too. Permissions to edit web part settings and create alerts A SharePoint user with site administrator rights is empowered to adjust connection settings for Alerts and Reminders web part. He/she can also add permissions to selected SharePoint user groups to create and customize alerts for other users. Customization of Email Alert A bunch of features to design alert's emails and SharePoint newsletters. Use rich text, add pictures, links, tables, tags, and track specific item changes in email. Send Reminders Define the schedule for recurrent events, month and annual reports, meetings, users’ birthdays, and other events. You can assign a notification schedule and send daily reminder before or after an event. 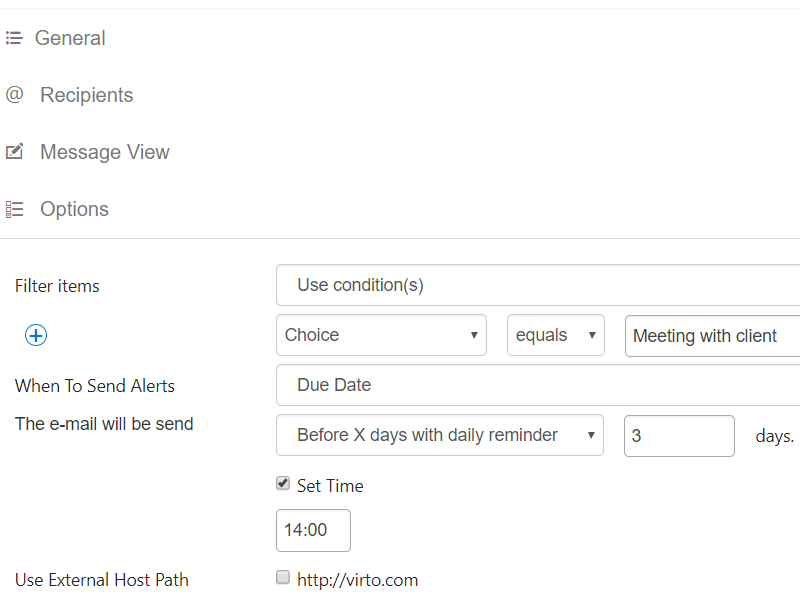 Summary Alerts and Notifications Create summary emails with brief information about all triggered alerts within a selected period. Send SMS Alerts and Notifications (SMPP Server Support) If an email alert from SharePoint is not an appropriate way of alert receiving for your team, send your notifications via SMS alerts. Frequency of sending Alerts Define how often the alerts should be sent (Immediately, Every Day, Week, Before or After X days to the event, or create a custom schedule). Send SharePoint Alerts about upcoming or overdue Events Create reminders to inform SharePoint users about scheduled meetings, upcoming, and overdue tasks. Send SharePoint Alerts and Notifications to XMPP Instant Messengers Users (Jabber, Miranda, etc) Use supported instant messengers to inform SharePoint users about any essential changes. Available in SharePoint 2010 and 2007. Pricey, but useful. SharePoint alerts tool works perfectly. I never miss an important event anymore! 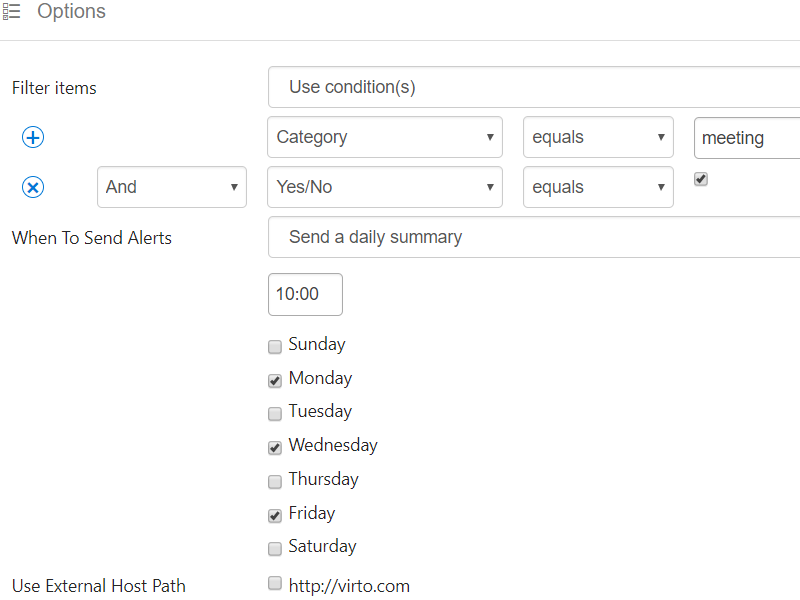 Virto Alert & Reminder is a great tool for sending reminders through multiple channels and includes brief notifications within it too. I like the fact that it can send alerts via sms, so it doesn’t limit who can receive alerts. Affordable solution, easy to customize to fit your custom needs. I am using Virto Sharepoint Alert and Reminder almost 2 years and I am happy with it. It has simple but smart UI that allows to create sharepoint alerts and custom email templates fast and easy.